03-25-2014 MICCAI 2013 Oral talk videos are avaialable. Please visit here. 09-26-2013 MICCAI2013 ended. Thank you very much for your participation. 09-13-2013 Venue & Access page is updated. Poster presentation timetable is updated. 09-11-2013 Venue and Local Transportation information is updated. 09-10-2013 Access to Nagoya is updated. 09-10-2013 Miscellaneous Information is updated. 09-09-2013 Workshop room assignment is released. 09-04-2013 Keynote speaker information is released. 08-31-2013 On-line registration site is closed. We are accepting on-site registration. 06-03-2013 Registration is now open! 02-15-2013 Paper submission is now open! 09-27-2012 MICCAI 2013 Website Open! 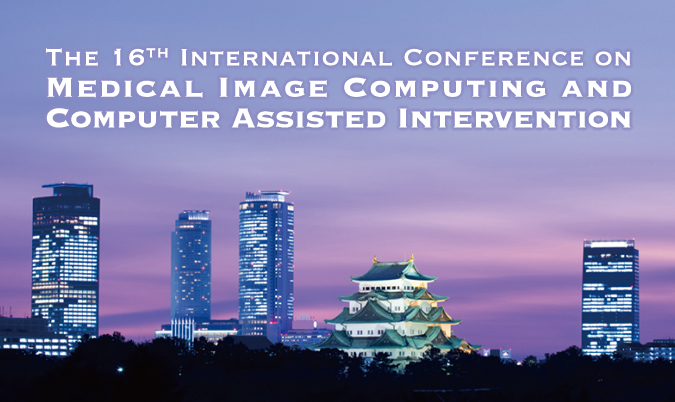 MICCAI 2013, the 16th International Conference on Medical Image Computing and Computer Assisted Intervention, will be held from September 22nd to 26th, 2013 in Nagoya, Japan, organized with Scientific Council of Japan. MICCAI attracts annually world leading scientists, engineers and clinicians from a wide range of disciplines associated with medical imaging and computer assisted surgery. The venue for MICCAI 2013 will be the Toyoda Auditrium, Nagoya University, Japan. It is easily accessible from the downtown of Nagoya by the subway. The venue is next to the subway station.